The Exploratorium museum captured a stunning view of the "diamond ring" phenomenon as totality came to a close. The Great American Solar Eclipse thrilled millions! 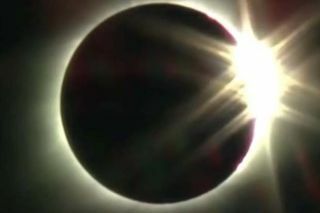 See the latest videos of the 2017 total solar eclipse as they come in from observers across the U.S., in the air and in space here below. Purch.com software developer Coraline Olivas captured this view in Teton Valley, Idaho. NASA's DSCOVR satellite's Earth Polychromatic Imaging Camera (EPIC) captured imagery of the moon's shadow as it traversed the continental United States. The space agency captured video of the eclipse and its shadow from several locations. NASA astronauts explain what it was like to see the shadow of the Moon from the International Space Station. A NASA camera captured the transit of the International Space Station on Aug. 21, 2017 from Banner, Wyoming. The final moments of totality over Madras, Oregon are captured by the Exploratorium museum. NASA jets captured imagery of the moment of totality. The Exploratorium museums view of the eclipse shortly aftet the moon crossed over the limb of the Sun. NASA cameras captured the start of the eclipse.